Instead, she does her best to keep up appearances, even as months pass and she can barely put food on the table—much less replace a light bulb. While she looks for a job, she lives in fear that someone will see her stuffing toilet paper into her handbag or pinching basil from a neighbor’s window box. Soon, blindsided by catastrophe, surprised by romance, and stunned by the kindness of a stranger, Tabitha realizes she can’t keep her secrets forever. 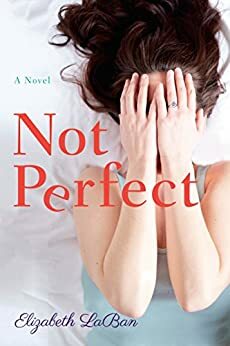 Sooner or later, someone is bound to figure out that her life is far from perfect. I guess it is easy to say that "I'd never do that" when you've never been in someone else's shoes, and I'll never be in Tabitha's shoes--if my husband ever left me, I have a job that will pay the basic bills around here and keep food on the table--but I can't imagine every doing what Tabitha did, and maybe that's why I never quite liked this book. Here is this woman with a degree from a fancy school who has been a stay at home mom and wife to a well-paid lawyer. They have all the trappings of their upper-middle class lifestyle, including private school for the kids, and a love for gourmet food. After months she realizes that her husband isn't coming back and that she has no money and so she looks for a job, and is given one, albeit one she didn't apply for and is probably not well-paid. Does she keep it, and keep looking, figuring some money is better than none? No, she just continues in her angst-filled self-pitying world and avoids anyone who might be able to help her. She steals basil from the neighbor's window boxes and toilet paper from friends but instead of selling her husband (presumeably expensive) cuff links she gives them away. Then there are the other characters. One is an old woman who offers Tabitha pot-laced candy and who makes it easy for Tabitha to "borrow" money she needs by leaving it laying about the house. The other is a man Tabitha meets at Stuart's alumni function who realizes she is an imposter (not an alumna) who becomes the new love interest in her life--and don't get me started on Stuart. They all just seemed strange, not realistic at all. I'd like to thank the publisher for providing a review copy via NetGalley. I read the second half of the book at a pace between fast and skimming so maybe I missed something, but I'm giving this one a "C", and hope that others enjoy it more than I did.